The author-illustrator, Tomi Ungerer said, name your destiny’s destination. 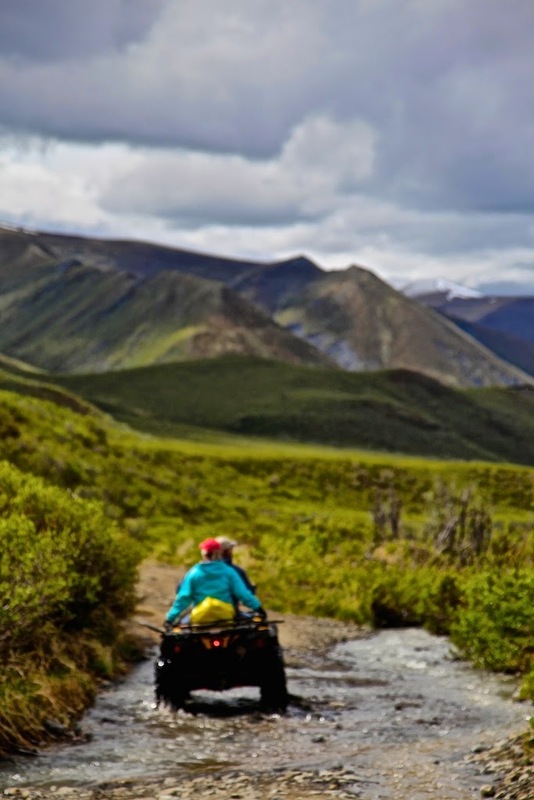 We didn’t have a specific Point B on our ride across the tundra on the backs of sturdy 4-wheelers; we just knew we were headed into the wild to imbibe the sky and tundra, and explore ancient fossil beds on unnamed creeks along the way. So we loaded up tools of the trade: rock picks and hammers, chisels, shovels, and a tool bag to carry our newfound samples. Sack lunches, water, a sense of humor (or two), wiley imaginations, and the willingness to embrace whatever stumbled across our path. We were searching for prehistoric marine life that lay directly beneath our feet. Here, in the green-covered mountains, we were looking for ancient sea life, as it were. We followed the trail up and down mountain passes, across rushing creek beds and into the wild, getting all muddied up in the process. Fortunately, we are creatures who take well to the mixing of earth and water and actually enjoy getting exceptionally dirty (as long as there is a shower or claw-foot tub at the end of the day). From the top of Belanger Pass, we hopped off our wheelers, and spinning slowly in place we took in the view of 4 different mountain ranges: the Alaska Range, the Talkeetna Range, the Wrangell-St. Elias Range and the familiar, in our backyard Chugach Mountain Range. You can lock your sight on one for a spell and get lost in a daydream of sorts. OK. Back to ground level now. After some bumpy riding over boulders and fumbling with very small turn ratios, we hit the Mother Lode. In an unnamed tributary to Alfred Creek in the Talkeetna Mountains, we found, you might say, decorated stones, or embroidered rocks. Attractive and textured. Cross-sections of variegated shells, like scallops, mussels and clams unfolded before our eyes. In the base rock of sandstone, we were, quite literally, standing on the beach in our mud boots, in the rain, way the heck out in the green mountains in a place that used to be saltland. Oh, Saltlandia! 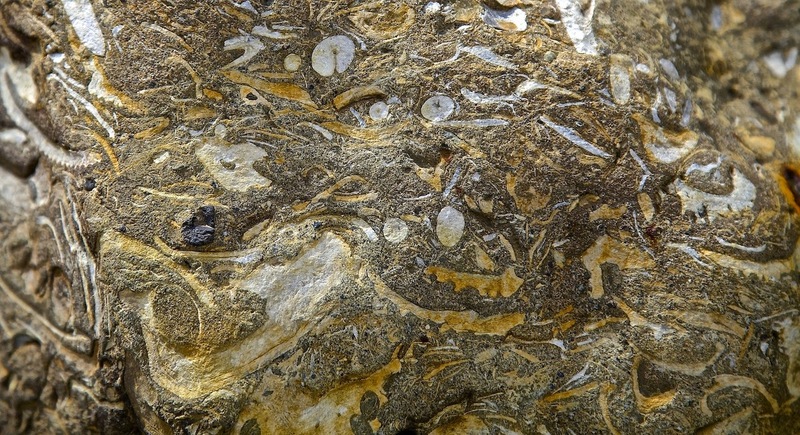 Here’s what the geologists and other rock fools really die for. 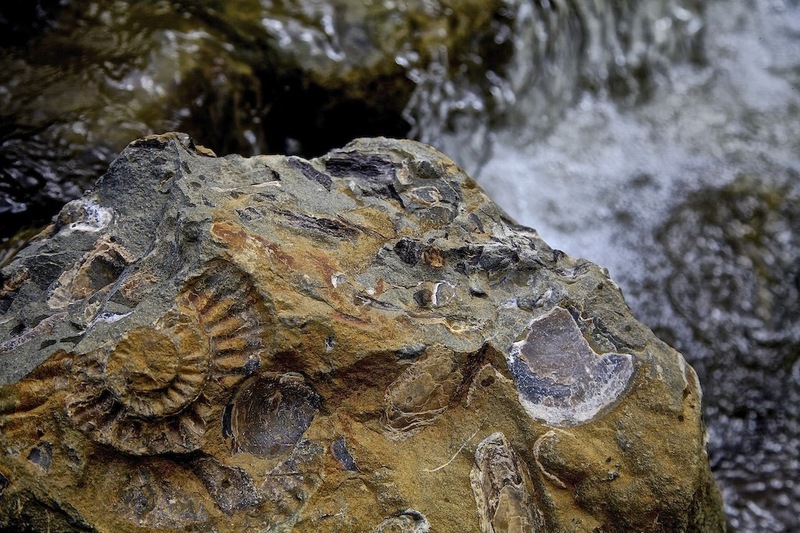 Ammonites…the spiral impressions of a prehistoric octopus-like animal in a shell. The only surviving and nearest relative of the ammonite today is the pearly nautilus. Everyone loves the nautilus shell, no? I swear sometimes I feel like I’m in a science fiction movie. …and take notice of the flowers, though sometimes found in very hard places…take notice and smell the flowers along the way. Wonderful photos of some wonderful territory, and great narration. And at the end? A connecting point between us — your photo of the ammonite. If you were here and we had a little time, I could take you to a hidden creek in the Texas hill country, where the same kind of shell lies exposed in the limestone, surrounded by clams, whelks and other such reminders of the great sea that once covered the land. Setting aside the scientific evidence for global warming, the hysteria and the politicization on both sides, there's a great truth often ignored. The earth's time isn't our time, and our poor, foreshortened vision, combined with a terrific lack of imagination, makes us think we're in control of what's happening here. We have a role to play, for sure — but it's not as large as we'd like to imagine! I like the message of your post, Monika. Go where the trail takes you… and take notice of the flowers, though sometimes found in very hard places… Good to repeat it to oneself from time to time. The yellow flowers seem to be Potentilla, am I right? Your expedition sounds brave to me, the lonely wilderness all around. Are there wild animals that could endanger you? Did you carry any weapon with you? Yep, they're potentilla. We usually carry bear spray; it depends on how remote we are, and if we're on foot or not. The best thing to do is make a lot of noise when you're on foot so you don't surprise a bear and her cubs.